Are these not the cutest thing ever? 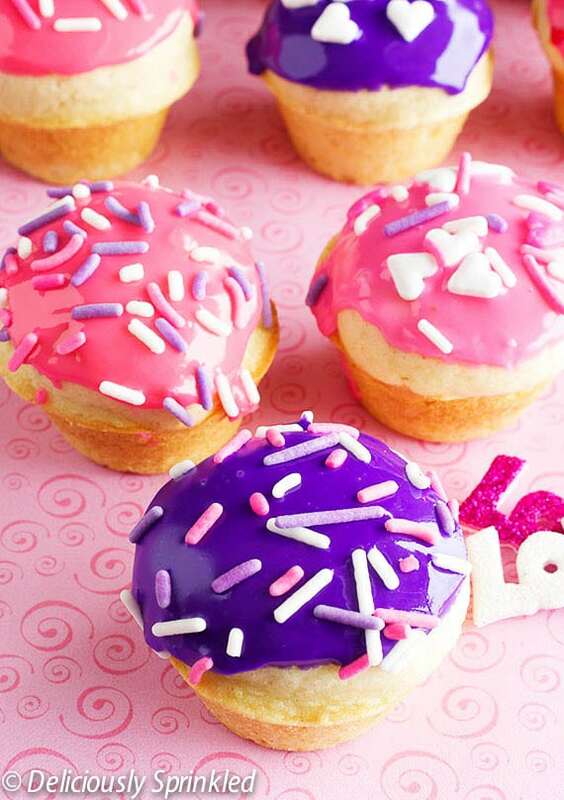 These Mini Donut Muffins are baked, not fried and taste just like a sprinkled donut from Dunkin’ Donuts (my fave place to get donuts)! 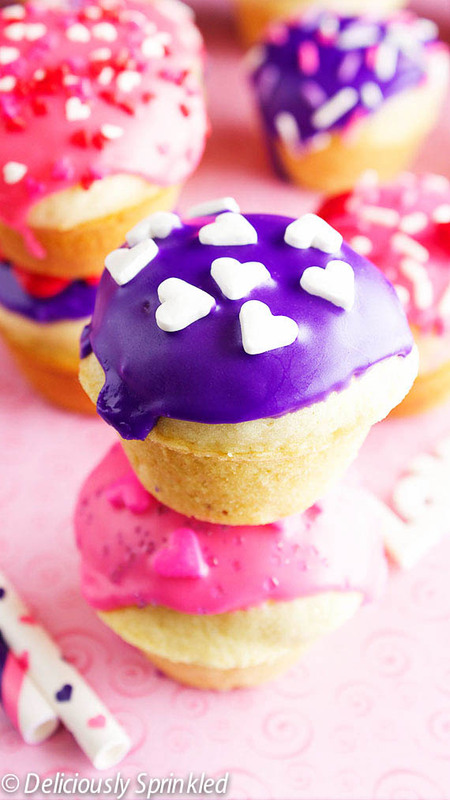 And they would make a super cute Valentine’s Day morning breakfast treat. I couldn’t stop popping these little guys in my mouth as I was decorating them. The little bit of nutmeg gives these donuts a great cake donut taste. Out of all the baked donut recipes I have tried so far, this is by far my favorite. These donuts were really easy to make. It took me less than ten minutes to prepare the batter, I actually had to make sure I didn’t miss anything because it was just WAY too simple. Preheat the oven to 350F degrees. Spray mini muffin pan with non-stick spray. Set aside. In a medium bowl, mix the shortening and sugar together. Add the egg and whisk it all up until it is smooth. Add flour, baking powder, salt, and nutmeg. Add the milk, butter extract and vanilla, mix until fully combined. The batter will be very thick. Spoon the batter into the mini muffin cups, filling 2/3 of the way full. Bake for 15-18 minutes or until a toothpick inserted into center comes out clean. Allow the mini donut muffins to slightly cook before glazing. combine the milk, powdered sugar, vanilla extract together until smooth. Separate the glaze into two bowls, add a 2 drops of pink food coloring to one bowl of glaze and two drops of purple food coloring to the other bowl of glaze. 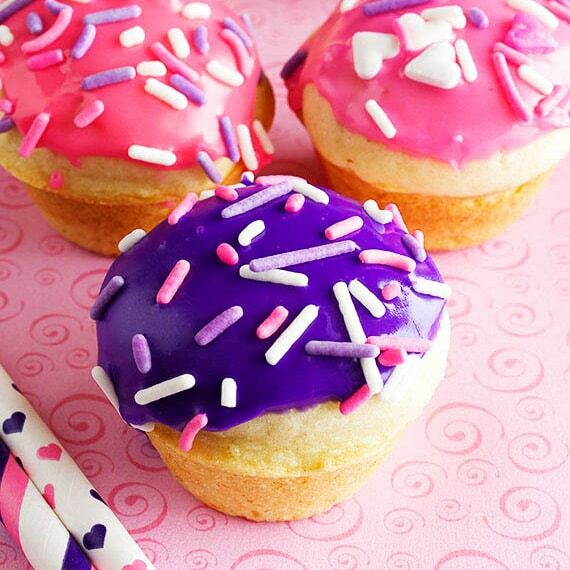 Dip the top of the donut muffin into the bowl of glaze, alternating between pink and purple colored glaze,sprinkle to decorate. *Store in an airtight container at room temperature for 3 days.